On the sheltered shores of the Doorin peninsula, this traditional limestone country cottage is set in 25 acres of private woodland. Looking out across Donegal Bay to Sligo, it is the ideal place for a quiet family holiday. Apart from the cows on their way to their pasture and the walkers bound for the beach, the only traffic disturbing the peace of the tranquil ‘boreen’ running through the land is the occasional car or tractor. Standing in an enclosed garden full of flowers, the house, in the family for over 50 years, has been lovingly restored and renovated to accommodate a family of six or two or three couples who like their private space. 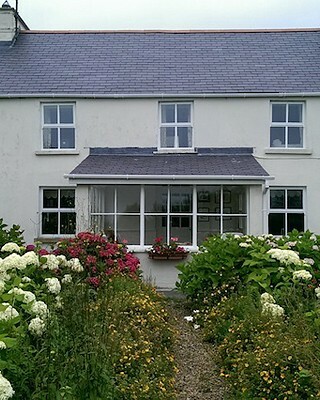 Although ideally located to visit the beauty spots of South West Donegal, the house will keep visitors happy and occupied on rainy days. Those with a taste for culinary ventures will find the kitchen fully equipped and everything they need in the excellent butcher’s and fish shop in Mountcharles village, 5 minutes away by car. The shelves, stocked with books and DVDs in several languages will satisfy the bookworms who wish to browse by the fireside in the cosy Victorian sitting room, or catch up on their series on the television in the extension. There are also cards and board games for more social activities.